So yeah ... it's snowing again. 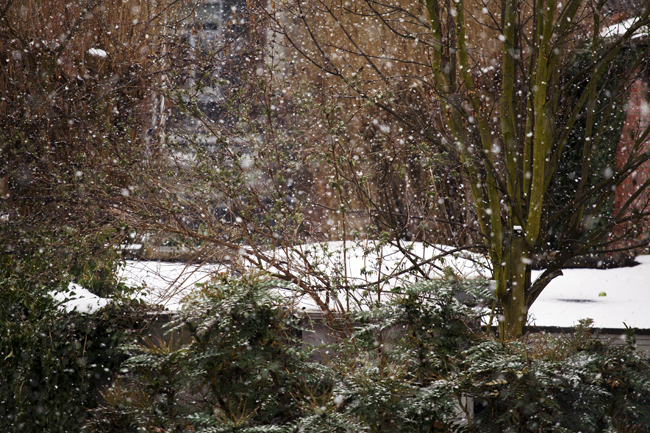 I took the photograph on 13 March but looking out from my window today, the scene is exactly the same. March 20, 2013 and it's snowing. As I set out across the city on the school run at 7.20am it was all about the umbrella, the correct amount of layers to protect us from the wet cold rain. On the return, lost in a book on the tram, I looked up and discovered that 'outside' had turned into yet another horrid snowy winter's day. To try and break the misery that is Antwerp this winter, Gert and I disappeared over to France, to the summer playground of the Parisians ... on a cheap Sunday night deal last weekend. It rained but I was on a roadtrip and has always delighted me. Although ... he had fallen on ice last week and sprained his wrist. Slowly slowly he is healing. The roads here are lethal in snow and ice, especially the shiny new bricks they've laid on the round-abouts. He fell crossing the one near home. We were talking on the phone at the time, and I was feeling particularly miserable after making a freezing cold, roadwork-infested, cross-city trek. There's nothing quite like hearing the Belgian bloke crash to the ground and lie groaning while seperated by more than a few kilometres. I arrived home just in time to head off to A&E with him. Oh yes, that was a long day. I suspect I shall be giddy with delight when the temperature goes up and the snow finally stops because it really is Spring. And rumour has it that these 2 hour city treks will be over as of the Easter holidays. I really need them to be. Antwerp, and its current mania for both roadworks and house improvements that seriously impede any progress along the pathways and tramways I take, is a bit like having my own seriously dark and snow-filled cloud over my head at all times. And so, on that happy note .... tot straks.